Dr Rekik and Dr Gordon co-hosted the first SINAPSE Image Analysis meeting at the University of Dundee. The program covered several medical image analysis topics including machine learning in neuroscience, retina imaging, whole body MRI, diffusion MRI, small vessel disease, etc. 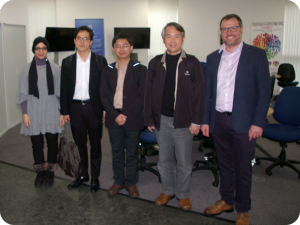 We were honored to welcome our invited speakers Prof Wen-Yih Isaac Tseng, Dr Yung-Chin Hsu, and Yao-Chia Shih from the National Taiwan University College of Medicine who gave keynote talks about their work on diffusion MR analysis and template creation. The first meeting of the SINAPSE Image Analysis group was held at the University of Dundee on the 20th September 2017. Attendees from SINAPSE and the National Taiwan University were welcomed to the Queen Mother Building by Image Analysis group Lead Dr Gordon Waiter and Deputy Lead Dr Islem Rekik, with a friendly tea and coffee morning and great opportunities for the delegates to network. Dr Ahmed Fetit from the University of Dundee opened the morning session with a talk on his work which used Dundee’s own VAMPIRE (Vascular Assessment and Measurement Platform for Images of the REtina) software for automatic quantification of retinal properties, which not only is cheaper than MR imaging, but can also be used to reveal vascular structure of the brain and discriminate dementias. Prof Wen-Yih Isaac Tseng began the keynote talks by introducing work from the Advanced Biomedical MRI Lab on diffusion weighted images, tractography, fast diffusion spectrum imaging (DSI) schemes, an image registration technique called large deformation diffeomorphic metric mapping (LDDMM), a diffusion template called NTU-DSI-122 and comparisons to the Human Connectome Project (HCP) templates, whole-brain tract analysis called tract-based automatic analysis (TBAA), and more advanced discussions on intricate crossing white matter fibres of the brain. Isaac also talked about how the mentioned advancements in diffusion imaging can be applied for earlier diagnosis of schizophrenia and prediction of treatment response. Dr Yun-Chin Eric Hsu (Post-doctoral student) discussed his development of the TBAA software, an automated toolkit for whole-brain tractography and a high quality diffusion sensitive template in the ICBM-152 space using the HCP diffusion data. Yao-Chia Shih (PhD student) continued on HCP-DSI template work where he demonstrated the HCP-DSI template had a lower signal-to-noise (SNR) ratio than the NTU-DSI-122 template, which resolved issues with complicated crossing fibres and gives a more detailed description of fibre tracts throughout the brain. Dr Islem Rekik (University of Dundee) started the afternoon oral presentations by discussing her exciting work using machine learning in neuroscience. Her work involves individual and population based learning strategies, brain disease evolution and outcome prediction (e.g., brain gliomas), brain disease dynamics (e.g., ischaemic stroke), brain development: modelling and prediction, synthesizing high-quality MRI images and brain connectomics. Dr Tom MacGillivray (University of Edinburgh) from the Image Analysis Core Laboratory at Edinburgh Imaging spoke about providing specialist support to investigators accessing data from a variety of imaging modalities including MR, CT, PET, ultrasound and retinal images. Tom coordinates the VAMPIRE initiative bringing together 10 international centres to provide semi-automatic analysis of retinal biomarkers. Tom and his lab support researchers through providing expertise in multimodal image analysis. James Sloan is an IDC student working with industry partners Toshiba Medical Visualization Systems Europe, and his project involves registration of medical images. He presented his work which investigated noise removal from images using autoencoders. Dr Lucia Ballerini (University of Edinburgh) was the final presenter of the day who discussed her algorithm for automatic segmentation and quantification of enlarged perivascular spaces in brain MRI, an imaging feature that has proven notoriously difficult to segment, manually or automatically. Dr Gordon Waiter (University of Aberdeen) concluded the session by expressing gratitude to all organisers, attendees, presenters and special guests from Taiwan who helped make the first SINAPSE Image Analysis group meeting happen. The image analysis group is a new platform which offers new opportunities to collaborate with like-minded researchers within the network. The meeting drew to a close with a group discussion of the possibility of launching an Intense Learning Workshop (ILW) that could cover topics such as machine learning, feature extraction, programming, image preprocessing, statistical analysis classes and much more.